While Searchable Encryption (SE) has been widely studied, adapting it to the multi-user setting whereby many users can upload secret files or documents and delegate search operations to multiple other users still remains an interesting problem. 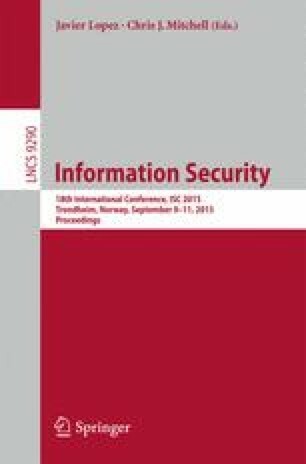 In this paper we show that the adversarial models used in existing multi-user searchable encryption solutions are not realistic as they implicitly require that the cloud service provider cannot collude with some users. We then propose a stronger adversarial model, and propose a construction which is both practical and provably secure in this new model. The new solution combines the use of bilinear pairings with private information retrieval and introduces a new, non trusted entity called “proxy” to transform each user’s search query into one instance per targeted file or document. The authors thank the anonymous reviewers for their suggestions for improving this paper. This work was partially funded by the FP7-USERCENTRICNETWORKING european ICT project (grant 611001).